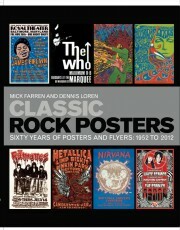 Classic Rock Posters showcases the finest examples of rock poster art of the last 60 years. Featuring no fewer than 300 posters, flyers and handbills used to promote both mainstream bands and sub-genres, the book is a celebration of the amazing visual diversity of the art of rock music illustration. Every genre of music is represented, from metal and indie to punk and new wave, and from progressive music to the techo-inspired rave art of the 90s. The selection of posters featured charts the changing styles of this popular visual art over the course of the last 60 years, and special features in each chapter focus on particularly influential bands, venues and artists. With posters selected by Dennis Loren (largely from private collections and the portfolios of fellow artists – Loren himself is a leading exponent of the art) and with its informative text by Loren and Mick Farren, this is the most accessible and comprehensive single-volume history of the subject. LA-based artist Loren and punk pioneer-turned-music journalist Mick Farren do a solid job at explaining the whys and wherefores. There comes a moment, though, when you want to veer away from the tour guides and take it in for yourself. There’s much to marvel at – Brian Pike’s perfect framing of the mod-era with the Maximum R&B poster for the Who and the warped psychedelia of the 70s, where designs veered from the realms of the purely functional, among them. Many of the posters’ subjects may have been forgotten – Greenslade, anyone? – but their legacy leaps from every page.